Trekking can be quiet challenging, but if you are equipped with the proper equipment and knowledge, you can have the most memorable experience of your life. 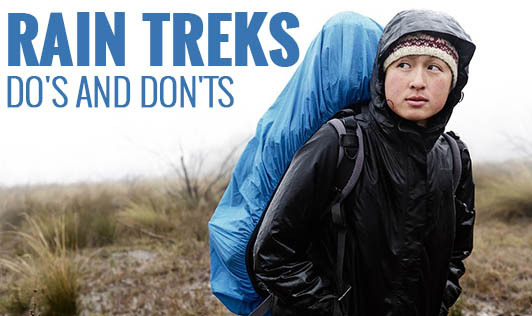 To have an enjoyable trekking experience you should know some basic dos and don'ts of trekking. • Always follow the instructions given by your group leader / local guides. • Take small steps while walking on the slippery slopes. • Always keep distance between you and the person in front of you while walking on the slippery slopes. • Watch the branch or plant that you are holding, it could be weak or may have an insect on it. • Carry all the waste back out of the forests. • While crossing rivers or streams, keep your feet properly on the bed. • Wear your old sports shoes to avoid blisters. • Wear khaki or olive green colored clothes that camouflage in the forest. • Leave markings at places where you think trekkers might get lost. • Carry your own torches. • Carry some food along with you. • Carry a first aid box and some basic medicines. • Carry an insect repellent cream like odomos with you. • Carry enough water for yourself. • Carry extra pair of clothes and waterproof them properly. • Do not stuff your back pack with too many things. Lesser the baggage, better it is to trek. • Do not breathe through your mouth while trekking. Breathing through mouth will exhaust you soon. • Do not put your weight on plants & branches. • Do not jump over rocks or rush to overtake, you may fall if the rock is slippery. • Do not light fire or cigarettes. • Do not litter in the forests. • Avoid whistling & shouting, it may distract wild animals & make them attack you. • Do not try to make your own path; there could be insects or reptiles there. • Avoid wearing vibrant colored clothes that might attract wild animals. • Talking while trekking will exhaust you soon, so avoid it. Wish you a safe and memorable trek..! !